A successful sequel builds upon the original. Or to put it bluntly, it should be bigger and better. 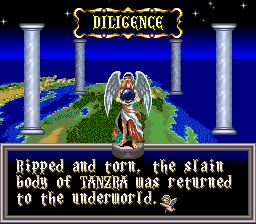 Sadly, that was not the case for ActRaiser 2. 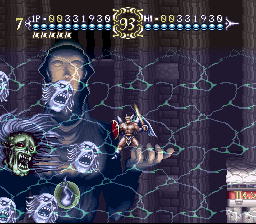 Released two years following its predecessor, ActRaiser 2 is a bit infamous for having ruffled a few feathers. 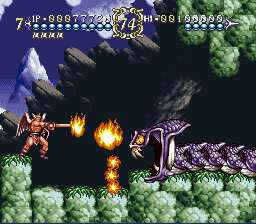 The original ActRaiser is such a beloved SNES classic that a sequel would have big shoes to fill. Quintet certainly tried, but the formula didn’t quite hit the right marks. But that’s not to suggest that this follow-up is a complete dud. It’s not without some merit, but it’s definitely a far cry from the first game. The box cover boasts the claim “100% pure action and excitement!” Well, they weren’t lying about the 100% action part. Say goodbye to the simulation aspect from the original. 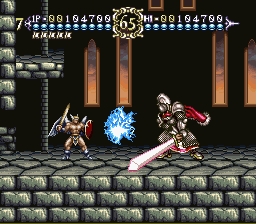 ActRaiser 2 is strictly an action title. And a rather uneven one at that. Your hero has wings but he can’t fly. He can, however, glide and dive. It sounds good on paper but the actual execution is a bit iffy to say the very least. 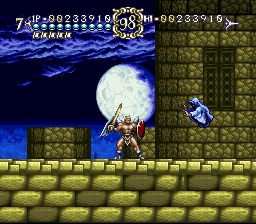 Slashing enemies above you feels very satisfying. As does a well-timed block. It’s just too bad your hero moves a bit slowly and somewhat stiff. Using the right one at the right time can make all the difference. 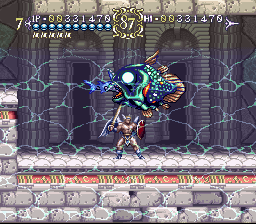 Appreciate the Mode 7 callback to the first ActRaiser. Scale up this tree while dealing with arrow-slinging goblins. Industen is broke up into two action sections. 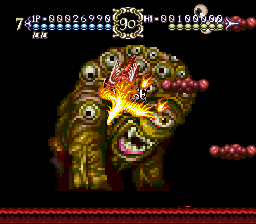 The first boss is a terrible plant monster that would make Little Shop of Horrors and Joe & Mac proud. 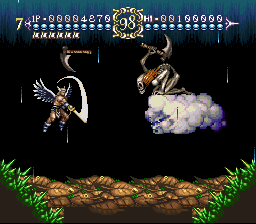 The second boss is a scythe chucking scumbag whose cloudy compadre will try to blow you [whoa… -Ed.] off the screen. Modero is up next. Or rather, it could be. One of the nice things about this game, contrary to popular belief that it’s a total dud, is that you’re given a certain level of freedom. You can tackle the stages in any order, which is nice. Modero is a hellish graveyard. 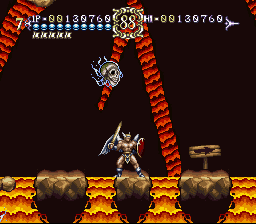 The last boss of this stage is particularly memorable. 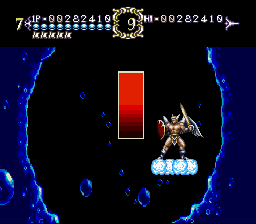 The SNES flexes its Mode 7 muscles. 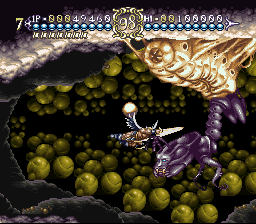 Demon’s Cave, not to be confused with Demon’s Crest (although admittedly Demon’s Crest does have a bit of an ActRaiser 2 vibe in terms of aesthetics), is full of demonic mutant spiders and nightmarish critters. And no, that ain’t a speaker system there. It’s a fill-up for your health or magic bar. The end boss would make Stan Winston proud. There’s a rather tricky jump right away that can be a bit infuriating. Not landing the clearing correctly leads you to fall below where enemies annoyingly respawn and sap you of precious health. The control takes a while to master and even then, it feels a bit shoddy and unreliable. 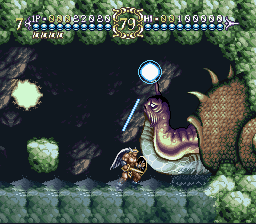 Battle a horrendous giant snake and snail to purify the country of Benefic. Saving your magic until the boss is highly recommended. Death Field is appropriately named. Some of the fiery sections can hurt you. 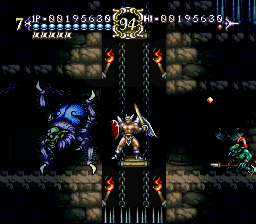 The mid-boss is reminiscent of the classic first boss from the original. Galloping riders aim to ruin your day. If you manage to survive the onslaught, a mad knight awaits you at level’s end. 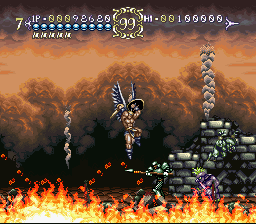 Another gorgeous burning stage, Almetha is one of the easier levels in the game. 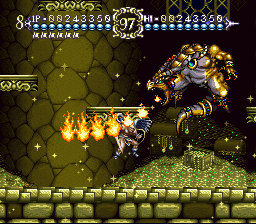 Massive monsters that aren’t bosses or even mid-bosses have always been a pet favorite of mine. That’s why I love this horned blue cyclops creature so much. 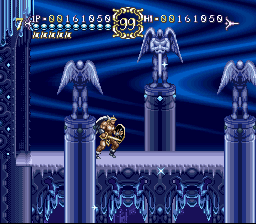 The boss fight is an intense one. Keep moving and don’t fall to an early grave. What’s up with all these great names like Modero and Benefic and then we have Palace? Oh well. Palace is your typical ice-themed world. 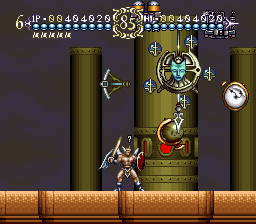 Make good use of the many platforms to help you conquer the boss. 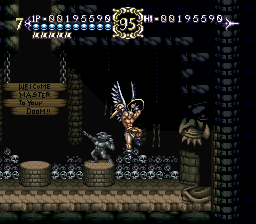 Gratis opens up with a sign that reads, “WELCOME MASTER to your DOOM! 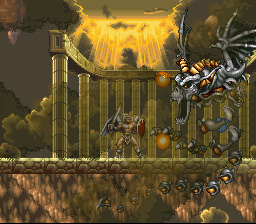 !” It’s a nice touch and reminds me of Altered Beast. More deformed mutant spiders await. 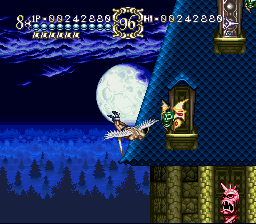 This level is very annoying as ghosts pop out of nowhere while you’re trying to make this big leap. This leads to cheap hits and starting all over again. The stiff control makes this level way harder than it should be. 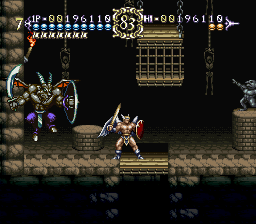 Provided you can safely navigate the annoying platforming, your reward is facing off with these two bastards. Stormrook is perhaps the best looking level in the entire game. Deception Demon rules this land and has been hiding in the king’s mind. Once you’re inside the king’s mind, find the blue door to fight the ghost mid-boss. Ominous red door leads to a showdown with the Deception Demon boss. Enter the sunken remains of a ghost town to kill this octopus-looking monstrosity. 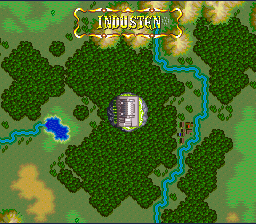 Altheria is somewhat similar to Tortoise Island. The boss here has a definite Ghostbusters vibe which I absolutely dig. 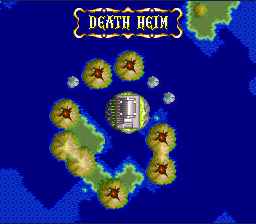 Death (Heim) awaits those skilled (and patient) enough to make it this far. 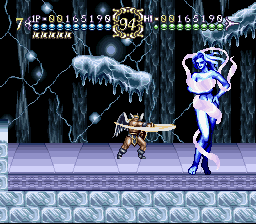 ActRaiser 2 is one of those games that most of the critics heralded at the time but is now (overly) criticized. 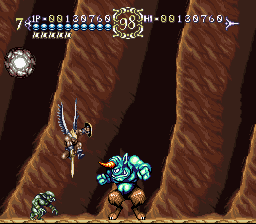 It’s one of the more polarizing SNES titles to this day. Most seem to dislike it but there’s a small camp that feel it’s become underrated and underappreciated over the years. 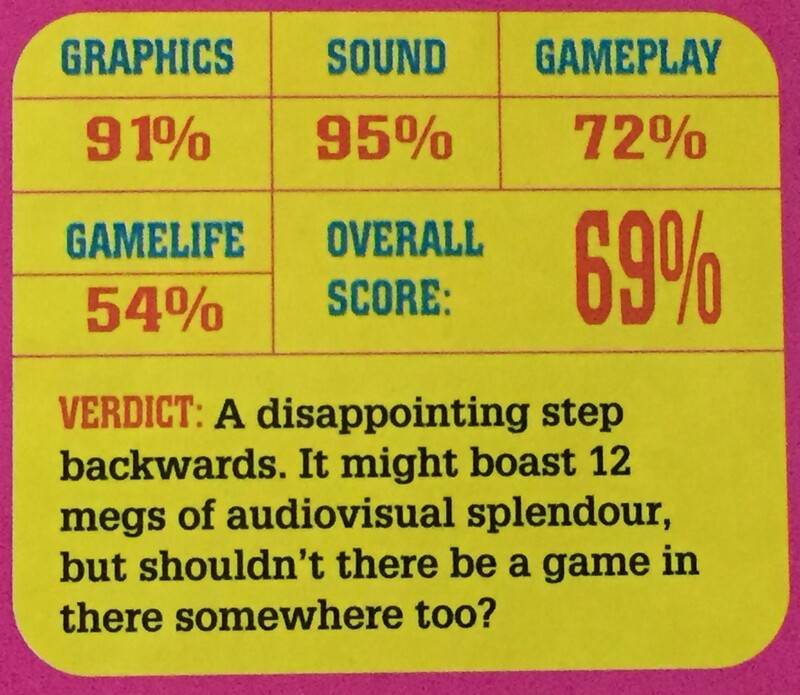 It’s interesting to look back on old gaming review scores. 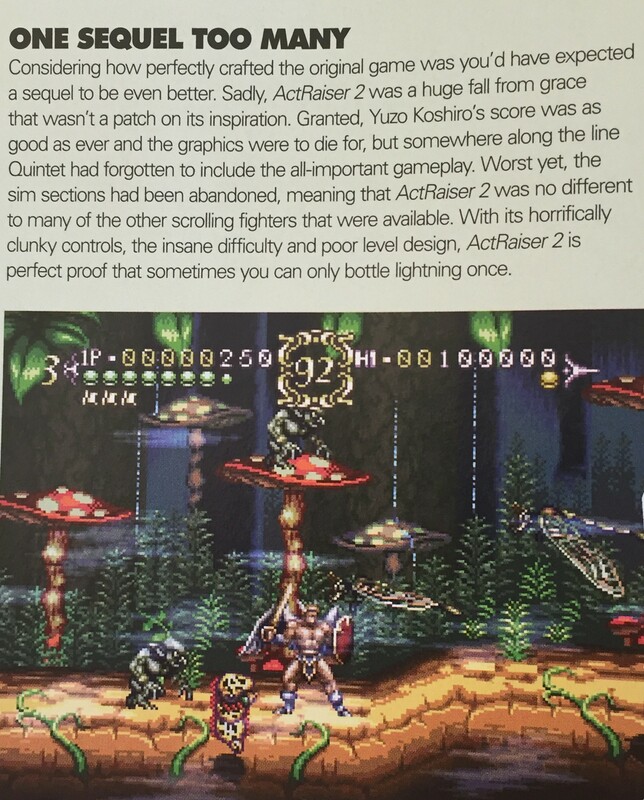 ActRaiser 2 was heavily praised back in November of 1993. 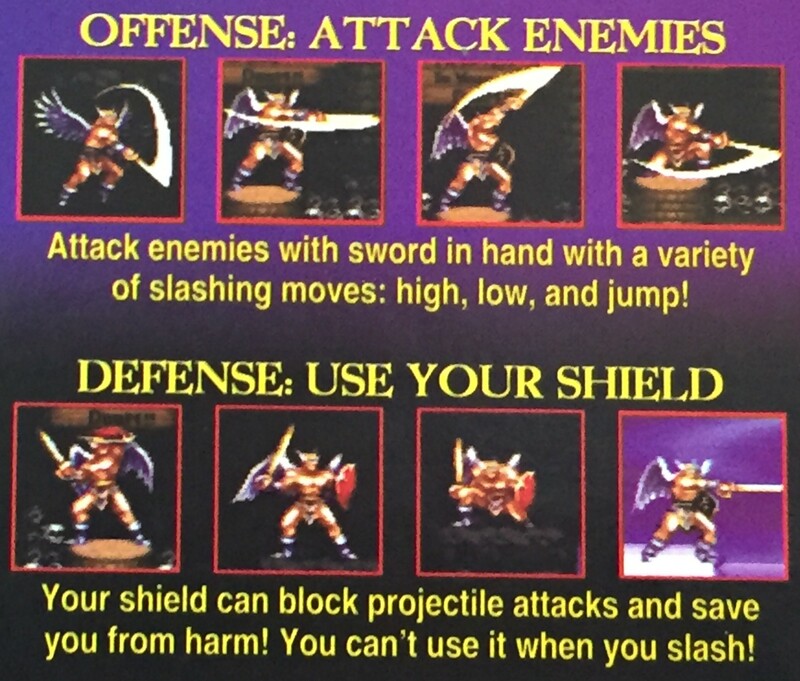 The picture above is from an issue of Super NES Buyer’s Guide — a sister publication of EGM. The red color indicates graphics and ActRaiser 2 was one of the rare games that got a full red to the max rating. Yellow indicates gameplay which you would think is most important to a game’s overall rating. Yet oddly enough, the yellow is about halfway for the first two reviewers yet they still gave the game a robust 87 and 88%. Er, OK. EGM gave it scores of 8, 9, 9 and 9. GameFan scored it 88, 94, 94 and 95%. Leave it to good old Super Play, however, to show some levity and pump the brakes on the sequel hype. They rated it 69%. 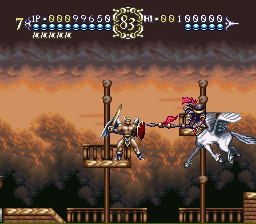 I find ActRaiser 2 to be a very uneven game. There are parts I like about it, but a lot of other parts that went awry. I do miss the simulation part of the game but I understand the desire to change it up a bit. 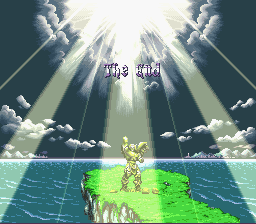 However, the execution faltered somewhat and thus hampers the game a good bit from reaching its full potential. Yes, this game is hard. Hard as a brick. And I don’t mind a hard game as long as it isn’t due to unfair enemy placement and/or stiff control. Sadly, both are culprits here. 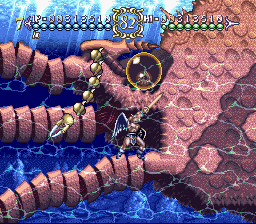 While I did enjoy myself playing through certain bits of ActRaiser 2, the unfair difficulty and stiff control always came back to stop my momentum from truly enjoying the game. It’s a shame too, as this could have been a very solid sequel if they had properly addressed those two significant issues. 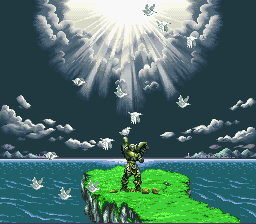 When it comes to graphics and sound, ActRaiser 2 delivers. 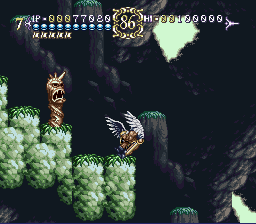 The visuals are sublime — it’s arguably one of the best looking SNES games of 1993. 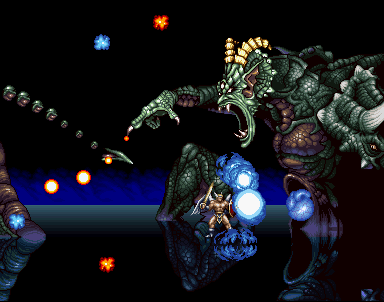 The amazing orchestral score, once again helmed by musical maestro Yuzo Koshiro, hits the mark. It’s just too bad that the most important aspect, the gameplay, is below par. 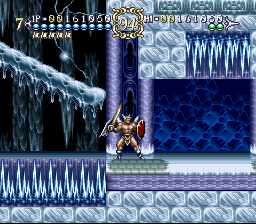 Especially when compared to the previous game which came out two years prior, ActRaiser 2 just feels like a disappointing drop-off. I wanted to like it so badly and at times I actually do, but the overall effect sadly misses the mark. I don’t think it’s as bad as some others have claimed it to be, but they have a right to their opinion. 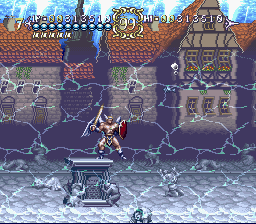 Without doubt, had this game been called The Knight Avenger or anything other than ActRaiser 2 then maybe it would have fared better with diehard fans of the first game. 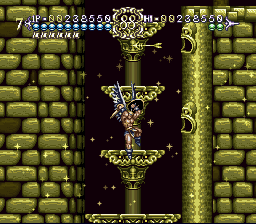 Alas, when you tack a “2” at the end of a name as big as ActRaiser, certain expectations come along with it. I, however, don’t think it’s all bad. Disappointing? Yes. Completely worthless? No. 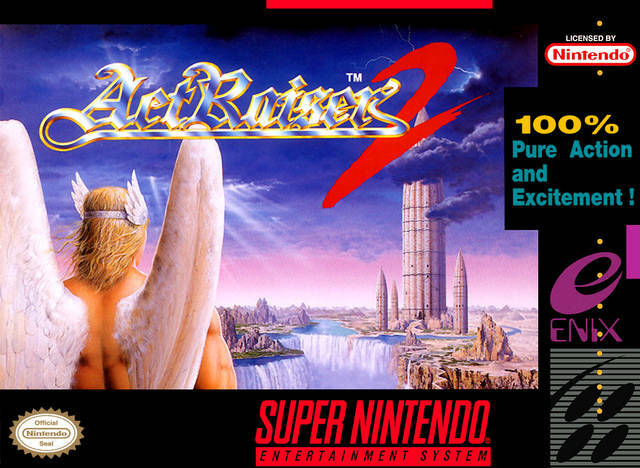 Regardless of how one feels about ActRaiser 2, I think there’s one thing we can all agree on: at least we’ll always have the first game to fall back on. 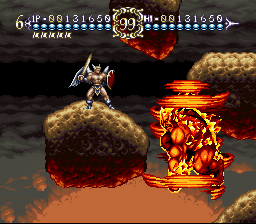 I could never dislike ActRaiser 2, personally, to me it’s really underrated. <=) But I do understand why people wouldn't like it so. 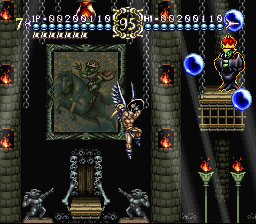 That being said, what I appreciate the most from this game is that Quintet took a lot of risks not just in terms of religious symbolism, darker tone, and atmosphere but in challenge value as well. 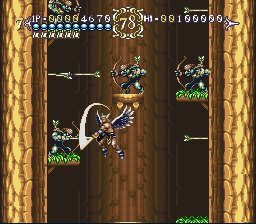 I like that you have a variety of sword controls this time around (in that you don't just swing ahead of you but upwards and downwards, the latter of which can be done while standing or crouching), I like that you had a shield as well which could block enemy projectiles, and I concur the wings do take some getting used to but when you get them down pat they can take you places after a bit of practice. It's true that the pacing in this platformer is a bit slow, but I'm of the opinion that if you're going to have a slow-paced platformer than it should be done with purpose, otherwise what you wind up with can feel like an awkward mess (i.e. 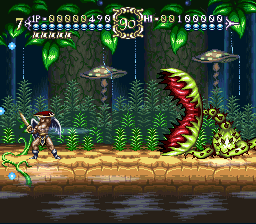 Produce's Super Adventure Island, Jorudan's Chōkō Gasshin Xardion and Gōsō Jinrai Densetsu Musya, and Ukiyotei's Hook, but these are just my personal examples). 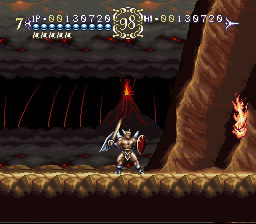 ActRaiser 2 is the kind of game that in my humble opinion is paced slowly but done so with a point. 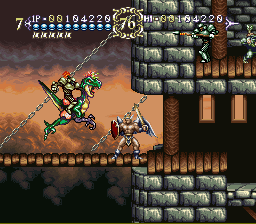 This is the kind of platformer that punishes you if you try to rush (blindly) and/or feel overconfident and rewards you if you go with patience, perseverance, a slow and steady pace (better to face one enemy at a time than be overwhelmed by fighting all of them at once, and memorizing their patterns can go a long way), and DETERMINATION. … Err, anyway. 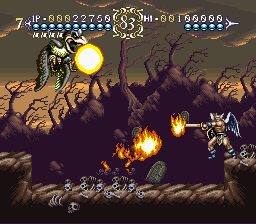 While the music here isn't quite as strong its predecessor, Yuzo Koshiro's Mahler-influenced soundtrack still complements the atmosphere even if it works primarily when heard during the proceedings as opposed to listening to it out of context (always a challenge to follow-up a strong soundtrack). 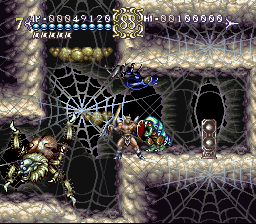 Lots of riveting string work at play, although the mid-boss theme stands out stronger than the actual boss theme for me. 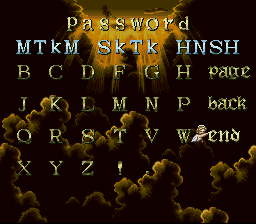 I like the stylized font used during the Heaven/Sky Palace sequence (it's elegant in style), and I strongly appreciate that it's got three difficulty settings as well as a password system (it's better than being stuck with only one save spot like its predecessor, not that it's that big a deal as it's not very long, but I digress). 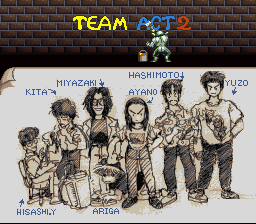 Many people cite ActRaiser 2 as the nadir of Quintet's sextet of Nintendo 16-bit games, but in my opinion that goes towards their co-developed venue Slapstick/Robotrek alongside Ancient (it's solid lighthearted fun, but its rushed translation and Ayako Yoda's inconsistent soundtrack ranging from terrible to tolerably listenable are points against the turn-based RPG for me, though I do love how at the start of it Illusion of Gaia and this game are referenced–though the fact that they typed it as "Actraiser 2" instead of "ActRaiser 2" bothers me on a personal level; one of my pet peeves is when I see people type the name with a lowercase "r" as opposed to the upper case "R" (not a problem if they're talking about the Japanese version of the first game, very much so if they're talking about the localized edition); only the Japanese version of the original had the lowercase "r" while the American/European version and second game regardless of version sported the capitalized "R"… do people not notice the uppercase letter in the name? It's right there!! I'm sorry, I know it's not something that'll bother everyone but it personally irks me whenever I see it; I blame Enix of America for that). 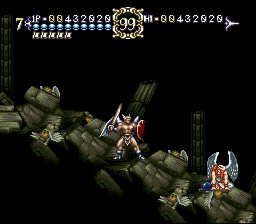 No, this game is not perfect and no, it's not for everyone (in the same way that Namco's Xandra no Daibōken: Valkyrie to no Deai is not for everyone, but that's neither here nor there). Yes, the world-building sim element is glaringly absent, and yes, it can be frustrating at points. But I feel that there is definitely more good than bad if you stick with it and give it a chance, and it's definitely worth exploring when you're in the right mood. Objectively ActRaiser 2 is a step backwards but on a subjective level I actually prefer this game the most (even though the first game worked so well that it didn't really need a sequel to begin with, but because it was hugely successful it was inevitable and Enix saw an opportunity but at the expense of part of what made it so impactful in the first place). Quintet meant well with this game in my opinion, and I do enjoy playing it once in awhile (I love it), but I completely understand why anyone wouldn't like it. As always StarBoy, you bring up a lot of valid points and I appreciate you adding in your 2 cents. I agree with you that ActRaiser 2 was made to be a deliberately slower type of action game. I’ve read from others that they were able to “master” the floaty controls and thus enjoy the game a lot more. It sounds like that was the case for you. Maybe I needed more practice but I felt I tried to learn the game’s control beyond normal and still was not able to get it down pat. This definitely affected my view of the game. 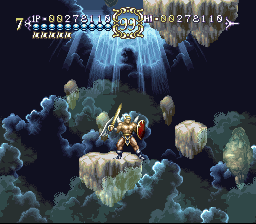 In the end, ActRaiser 2 is the classic proverbial mixed bag for me. 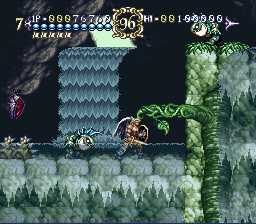 It’s definitely got some shining moments (I agree that the wider range of attacks available is pretty damn cool) but it’s also got its questionable points (the “silly” looking normal enemies don’t quite match the tone of the game and the less than stellar control). To me this all points to a game that could be anywhere in that 5.0-7.0 rating range. I gave it a 6.0, which in my book puts it in that “decent” category. However, considering the stature of the game (fair or not), my 6.0 is moreso on the disappointment side. Not all 6.0 scores are created equal in my book. For example, I gave Harley’s Humongous Adventure a 6.0 as well, but that game to me sort of “outperformed” my expectations of it. 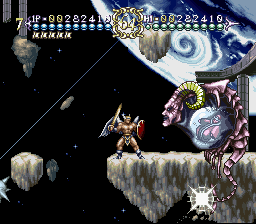 ActRaiser 2 is a game I expected better things from. Both are 6’s to me, but for pure gameplay value I slightly prefer HHA, even though AR 2 is clearly far more ambitious and a bigger budget title. Anyway, I’m rambling per usual now, lol. It’s good to hear from you again Star! As always, you always raise up some cool facts and I appreciate your opinions on these old SNES titles. 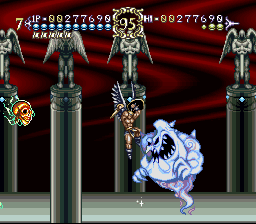 BTW, I know you’re not so much a fan of SNES Hook as I am, but it’s all good. As you said, to each their own. Hook is slow and I can see where some may consider it an “awkward mess.” But I love its visuals, soundtrack and “whimsical” atmosphere. It is a nice precursor to what would eventually become SkyBlazer. 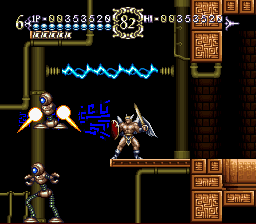 Oh yeah, I agree with you on the whole ActRaiser 2 vs. Actraiser 2 thing. That stuff annoys me too even though I tend to let many things slide when it comes to this hobby. However, it’s definitely one of my small pet peeves when I see people spelling the capital R as little r, lol. I can totally relate with you on that one!